When Next Step Produce began, we felt it needed a mission statement. As you saw on our home page, our chosen mission statement is “Committed to growing excellent vegetables in harmony with nature.” Over the years, many steps have been taken toward realizing this mission. Growing grains is one of these steps. Nature, landscape, in this bio-region is diverse. Diversity is part of this Earth, of life. Diversity is part of a bigger sustainable picture. Growing small grains fits in well with all of this. Taking on new endeavors means learning new skills. Our combine (a machine that cuts, threshes and pre-cleans grains) is an old historic model (Allis Chalmers All Crop) which was purchased over two years ago. In 2010 we did our first harvesting of small grains and gained some experience. Most of the seeds were then used and planted as cover crops— crops planted not for the intention of consumption but with the intention of protecting the soil from water and wind erosion during the winter months. 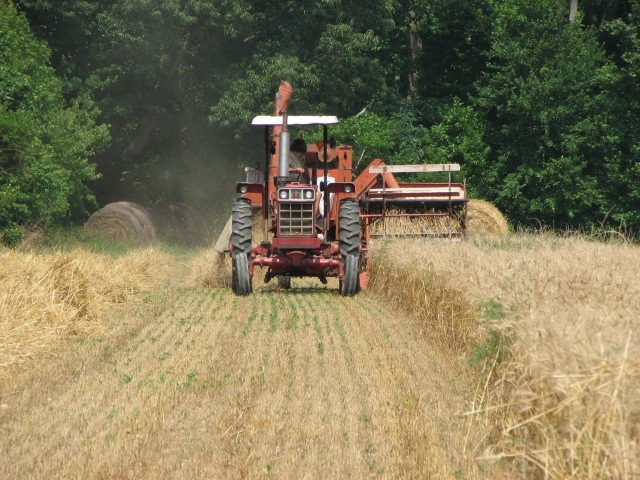 In the fall of 2010, we sowed wheat, rye and barley for consumption. And in the spring of 2011 we planted oats. All of these were harvested this summer of 2011. You may wonder why there was such a delay in bringing the grains to market. Well, new skills needed to be learned first. When the grain comes off the combine it still has chaff and potentially other (weed) seeds in it. Our hope to get the grain sufficiently clean with an “air screen cleaner” proved too optimistic. We needed more to get the grain up to par. A second cleaner, working on a different principle, was needed. But first a lot of research needed to happen. But wait!—there are tomatoes, peppers, eggplant, etc., to pick; fields to prepare for fall plantings; all that arugula, salad mix, turnips, etc., to seed. All this takes time, and finding the time among it all to learn new skills took a lot longer than expected. But eventually a decision was made as to what kind of secondary cleaner would be required. We chose a specific gravity separator. After many phone calls, we found a used, size-appropriate gravity separator in North Dakota. It then took one more month for the seller, a busy man himself, to get it ready and to ship—this machine is about 1600 lbs. of metal. Finally, now November, it is hooked up and ready to go. In the meantime, it’s time for the fall grains for the 2012 season to be planted. Grain cleaning is a very specialized business, and there are many machines capable of doing very specific things, such as separating long from short kernels, full from shrunken kernels, or round from long. As the situations change, more will be needed. Grains are often milled into flour. For Next Step Produce to acquire a good mill is another endeavor. We would need to define our expectations of the mill—with what material should the actual milling happen; what temperature rise is acceptable; what preserves the wholesomeness of the grain the most; what capacity; etc.—and then a lot of research would need to happen. Flour is not the only way to use small grains, however. Look at rice—many people have never used rice flour in their cooking. Wheat, rye, oats and barley can be used in the same manner as rice. It may take a bit longer to cook. It will taste different. But join us in our new endeavor—cooking and eating should be part of a bigger sustainable picture as well. 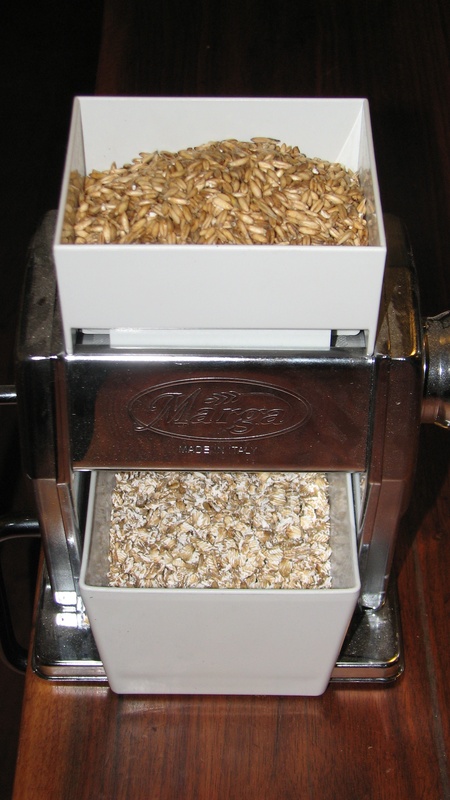 An easy way to reduce the cooking time for all grains is to pass them through a table-mounted, hand-cranked, roller mill. 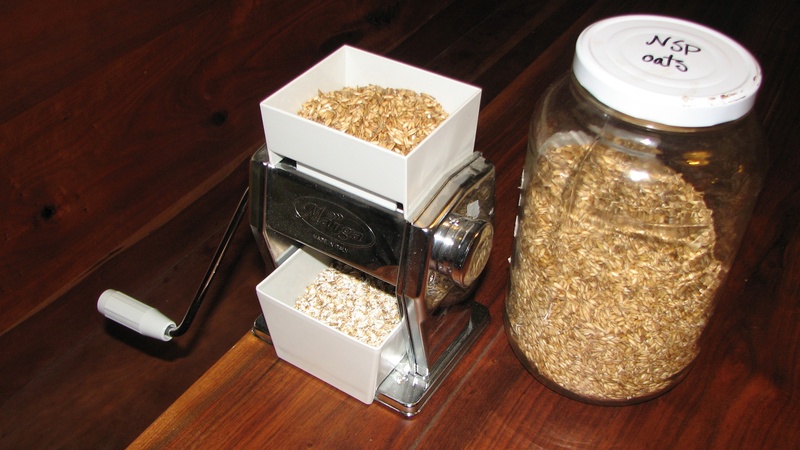 It is also called a grain flaker mill. We have one on display at market and we highly recommend it. We have had one for over 10 years and we love it—especially our children. It turns wheat berries into cracked wheat for a delicious breakfast porridge (known as cream of wheat). It turns rye berries into cracked rye, which can also be used in a breakfast porridge. 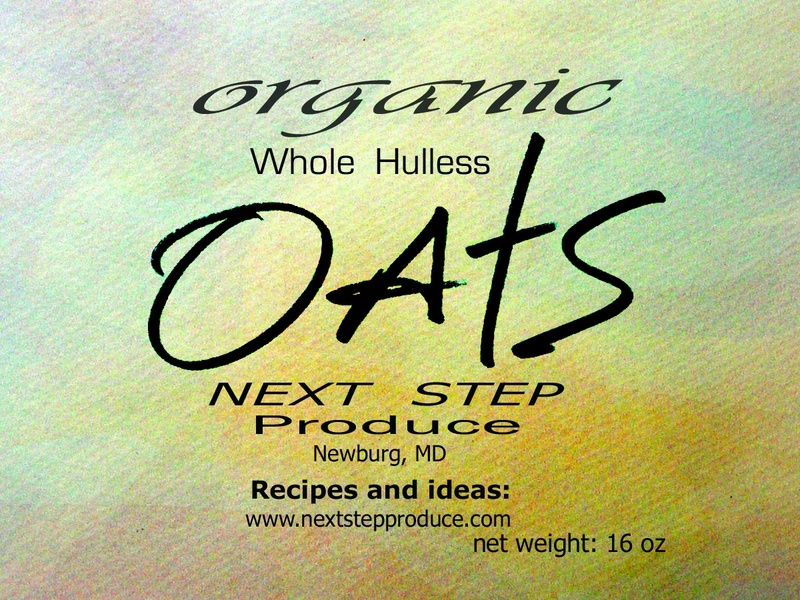 It turns oats into beautiful, truly old-fashioned rolled oats. Most important, it’s an easy and fun way to include small children in food preparations. They love it and it connects them. It is a great step in eating wholesome, fresh food. We can recommend two sources for the Italian-made roller mill, which cost around $100.00: Wisemen Trading and Supply and Lehman’s. The packaging we have chosen for our grain line is cellophane. This is cellulose-based (cotton wood) and is therefore biodegradable. Our labels are designed by Peter Nolan, designer, artist and astrologer. If you like his work, would like to know more, or are in need of some design work, he can be reached at lazureman@yahoo.com. What a lovely family and beautiful farm!!! I enjoyed reading about your exceptional attention to to detail concerning soil quality to nourishing produce! I wish that we were neighbors! I love your oat groats. They keep their shape and are versatile in many recipes. Will you be growing beans to store as well? What variety? Peggy, thanks for visiting and glad you’ve begun to cook with wheat berries! If you read through our basic cooking instructions page, you’ll see that you can drastically reduce cooking time by soaking whole grains overnight. Hope you continue to enjoy them! A few months ago I bought several of your whole grains on a farmer’s market. Can I buy them again online? We unfortunately are not set up for online ordering. But please visit us at the Dupont farmers market again soon! It is correct that we are not set-up for online ordering but we do welcome email or phone inquiries for delivery. Why when I click on the recipe for wheatberry, cauliflower and mint, do I get a recipe for rye bread? Please advise. So sorry for the trouble. The link has been repaired, so it should direct to the salad now. We just bought some of your flour from Chesapeake’s Bounty and we are looking forward to making some bread. However, I wanted to double-check something about your milling process: do you leave the bran and the germ in the flour when you mill it? Thanks! Thank you for the purchase! We sell only 100% whole grain flours, so yes, the bran and germ are part of the flour. With this flour you can enjoy all the nutritional and gustatory benefits of whole grains without the nutrient loss because it is ground fresh right here on our farm in Newburg, Charles County. We look forward to hearing back from you! Thank you for the fast response! Now I have another question for you: if the germ is still in the flour, does that mean we should use the flour quickly, so it doesn’t go rancid? How long of a shelf life does your fresh-milled flour usually have? Thanks again! More complicated questions take longer to respond to; I may even need a rainy day to do so. So, to your question on shelf life, it depends who you ask and what you would like to gain from the flour. Yes, the fresher the flour, the more nutrients it has. If we look at the wheat berry itself, if planted, it will sprout and grow into a new plant. In other words, the wheat berry is still alive. As soon as the wheat berry gets ground into flour it no longer can produce a sprout. An oxidation starts and nutrient degradation begins, in particular vitamin loss. Therefore, for the health purist, having a mill at home and grinding on a per-use basis is the way to go. Now, together with the oxidation, a gluten-stabilization happens. This stabilization leads to increased gluten strength and with that an increased loft. This insight is what led to the bleaching of flour. Bakers decided that a yeasted loaf of bread with lots of loft is more desirable than a more compact loaf of the same weight. So they stored the flour for over a month to give the oxidation and gluten-stabilization time to happen. Then chemistry came along; the bleaching process, yes, bleach as you use in the kitchen, creates that oxidation instantly and the miller no longer needed to store the flour. Vitamin C has the same effect, as do rose hips if you prefer to stay away from chemistry altogether. So, Coming back to your question, if you are after nutrients, fresh is better. If storing is required, store it cool or in the freezer. The cold temperature slows down the oxidation and I would plan on using it up sooner than later. Just remember to take it out and let it warm up before you begin working with it. If it does get older, it most likely is still way fresher than what you can get in the store. And as a baker once said to me, one month old flour is still fresh for him.